Before you run to this amazing and hard workout you should try to do workout 7 & 8 and only afterwords do hypoxia and legs. Why is this so important and hard? Most masters swimmers that didn’t yet practice the WEST swimming technique will feel they don’t have enough air, or their legs will sink. 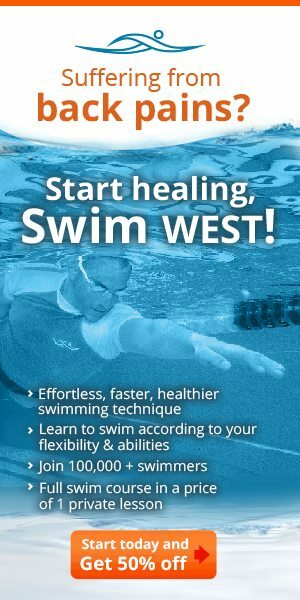 In this exercise you will learn how to swim without air after a fast 100 m kicking. In the kicking you can use a kicking board. 2 4X50 with fins 15 sec rest between each 50 Every 50 you increase the number of dolphin kicks, first 50 5 dolphin kicks and continue freestyle, 2nd 50 6 dolphin kicks......until 8. 4 100 kicking 85%+100 freestyle breathing every 7 strokes+200 every 3.} X4 times Between the first 200 rest 20 sec. Your goal is to swim swim all the 200 at the exact same pace. Between each 400 rest 45 sec. 5 3X200 freestyle at the same pace as the previous exercise. 6 3X200 with paddles and pull buoy 5 sec faster that the previous exercise.